A croquette is a patty of various types of meat mixed with other ingredients. It is often associated with the Great Depression when housewives had to stretch their pennies. This economical dish, however, is far older than that. The word croquette finds its roots in France, circa 1700, and means “to crunch.” Many people associate croquettes with salmon, but the recipe can be created with almost any cooked meat. I use the following recipe with cooked chicken, turkey, and ham. Over the years I’ve tweaked and added to the simple croquette process to arrive at the ingredients presented here. 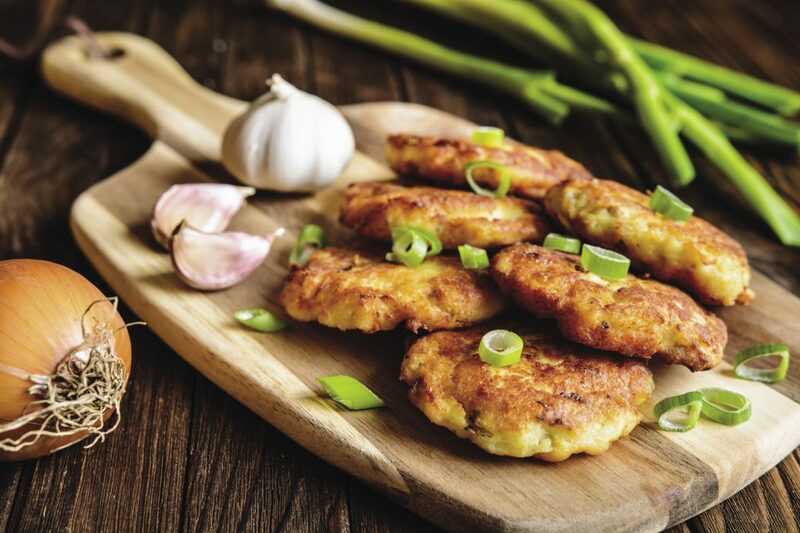 The wonder of croquettes is that the cook can improvise with any ingredients on hand. Use your imagination and the contents of your fridge to add to and adapt this recipe. Croquettes are one of the best methods of using up leftover, cooked meat so the meat and your money don’t go to waste. Combine all ingredients EXCEPT the bread crumbs and soup. Mix well. Add 1 cup bread crumbs and ½ cup soup. Mix until the mixture has the consistency similar to raw hamburger. If it won’t hold its form, add more bread crumbs. If the mixture seems too dry, add more soup. The mixture should be moldable to form a hamburger-like patty. There are two methods of forming the patties. Method 1: Scoop out a ball about the size of a plum, round it in your hands, and place it on a flat surface, flattening it with the bottom of a jar/glass or your palm. May be frozen or cooked immediately. Method 2: Roll out the mixture onto a cookie sheet and refrigerate for about 2 hours or until stiff feeling. Use a large biscuit cutter or inverted glass/jar to “cut” uniform patties. These patties can be frozen or cooked according to the following instructions. Frying the patties: Place 3-4 Tbsp. shortening or butter in skillet. Melt. To test to see if the skillet is the right temperature, place a 1-inch piece of bread into the melted shortening/butter. The bread will brown in one minute if it is ready. Once the skillet is hot enough, place the patties into the skillet and fry on both sides until browned to preference. My family loves it when I serve these with grated cheddar cheese over the patties. Sprinkle the cheese over the patty fresh out of the skillet and it melts perfectly. Angeline Hawkes is a Bram-Stoker Award nominated professional fiction writer. She has written for Backwoods Home Magazine, Self-Reliance, and others. Writing as Louise Harding, she has written for E-How and E-How Home & Gardens. When not writing, Angeline spends her time sewing, gardening, growing medicinal herbs, knitting, canning, and trying to raise her children in a self-reliant manner with her husband on their homestead Canterbury Trails Farm in Texas. More on Angeline can be found at http://www.angelinehawkes.com or https://www.amazon.com/Angeline-Hawkes/e/B002BLL2LM/. you can also use a homemade white sauce and forgo store bought soup. It is also much cheaper and tastes much better. I use 4 tablespoons of butter, 4 tablespoons of flour and after that has melted and cooked while stirring for 2 minutes to get rid of the flour taste, I add 1 cup of milk. A hamburger press works really well with these also. We flash freeze them and then put them in ziplock bags . When we want to eat them we take them out and bake them at 350 for about 20-25 minutes until hot through out. Great for meals which you do not really have to plan ahead for.